You can show an external device, which is connected to your screen, in any zone using the source input widget. External devices such as a freeview box or Apple TV, once connected to a source input on your screen, can be displayed within your layout. Select your designated zone and enter the zones playlist by double clicking on the zone, or click 'Edit Zone Playlist'. 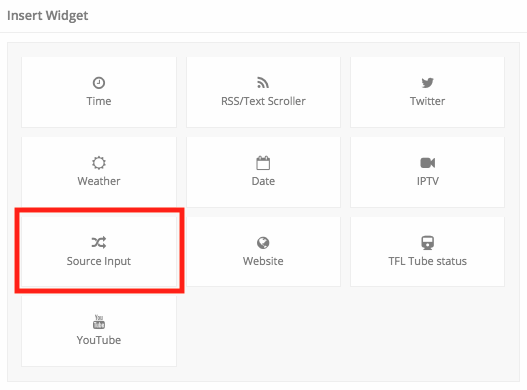 Click 'Widget' and select 'Source input' to insert the source input widget. The only setting you need to configure for this widget is to select which source input you wish to display in the zone. Simply use the 'Input source' dropdown menu to choose either 'AV Input 1', 'PC Input 1', 'HDMI Input 1', or 'DVI Input 1'.